Just strolling through the Exhibit Hall of Comic-Con this year, you can see it: more booths, bags, and banners displaying strong females. Women in downtown San Diego agreed on the opening day of Comic-Con Thursday that the influence of the #MeToo Movement could be felt at the event. "The panels I'm able to go to this year compared to the first year I came are incredible," said Donica Hart, a Comic-Con attendee. "I'm going to one on the importance of women in comics and another one on body diversity." 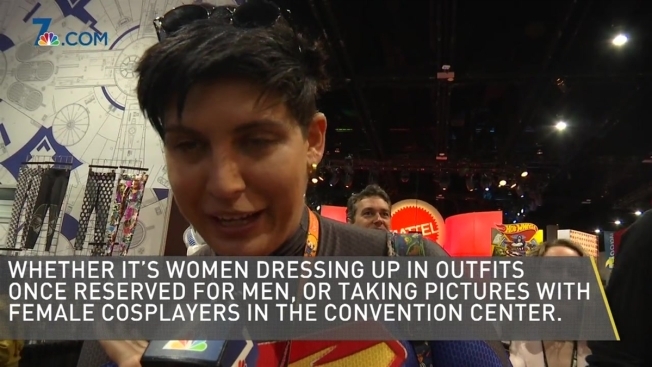 Other women said they felt more comfortable dressing in cosplay costumes that were once reserved for men: outfits showing off Superman, Batman, and others. "One gentleman earlier actually asked permission before putting his arm around me for a photo," said cosplayer Maureen Dawson. "That was something new and I liked that." The San Diego Metropolitan Transit System is hopping on board as well. This year they have four collectible trolley passes all featuring cartoon females and designed by women. "All the designers at MTS are women," said Marcial Gutierrez of MTS. "They were inspired by the #MeToo Movement and female empowerment." You don't need a badge to see all the female-inspired exhibits this year. For a list of things to do outside the convention center, click here.